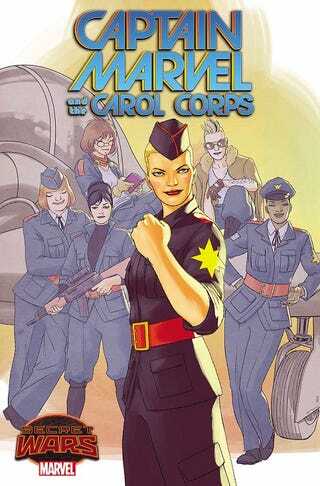 Captain Marvel And the Carol Corps Coming Soon! Marvel has been announcing new Secret Wars titles pretty much every day and today, they announced one of the awesomest ones yet: Captain Marvel and the Carol Corps, written by Kelly Sue DeConnick and Kelly Thompson and illustrated by David Lopez. In Carol Corps, Danvers will lead an elite all-female squadron of fighter pilots stationed at a base called Hala Field, where she is the only powered human; this leads them to "set about helping Carol try and answer a question about where she is from," says DeConnick, "and that puts them in conflict with some of the greater forces of the Marvel Universe." This sounds so fun and so awesome. Click the link to see more concept art about the Banshee Squadron and Carol.